Listed below is the Flax Growers' Bounty List which was published by the Irish Linen Board in 1796 listing below a portion of this list for all the flax growers in County Down, Northern Ireland. This was when the Linen industry was at it's height. 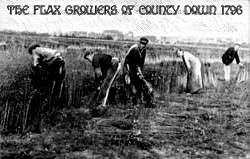 A government program to encourage the growing of flax.which awarded the growers. It is a valuable substitute for non-existent census material for this period in Ireland, containing the names of around 55,000 small farmers is almost every county (Dublin and Wicklow being the only counties not covered) who received an award of a spinning-wheel or loom in return for planting certain amounts of flax. "To the person who should sow between the 10th day of March and the 1st day of June 1796 with a sufficient quantity of good sound flax-seed, any quantity of land, well prepared and fit for the purpose not less than 1 Acre -- 4 Spinning Wleels, 3 Roods -- 3 ditto, 2 Roods --2 ditto and 1 Rood -- 1 ditto. And to the person who should sow in like manner any quantity of like land, not less than 5 Acres, a loom or wleels, reels or hatchells to the value of 50 shillings, and for every 5 Acres over and above the first 5, a like premium"
To search a name, click on the first letter of the last name then use Ctrl + F and enter name, or simply scroll down. Sometimes children were listed on the growers list. Many of these people were related to each other in County Down, if the place name and last name are the same chances are they are one family. Land was not given to the oldest or heir, but in a more family oriented and loving manner was divided among all the children. These growers wre usually the middle class. All of the names listed here were awarded at least one spinning wheel. There are nearly 3,000 names for County Down.